It is almost midnight and i wanted to share another card I made with some free digital stamps by Gerda Steiner Designs. Image is printed on Copic friendly paper and colour with Copic markers. Then i die cut it with a stitched rectangle die, matted it with black glitter cardstock, another stitched rectangle from silver metallic cardstock and a dotted scalloped rectangle from purple cardstock (to reflect the colour of the new year). I spread a few rainbow sparkle confetti from Simon Says Stamp all over it for a more festive look and covered the numbers with Tonic Aqua clear shimmer pen (I just love this pen so much). I will upload this project to the Simon Says Stamp Monday Challenge Party and to the Wednesday Challenge Anything goes. That is all from me from this year, I hope you enjoyed all that i shared and will continue to follow me in 2018 too. I have some fun planned already. Happy New Year! I hope you are all having a wonderful time celebrating the last day of 2017 and welcoming all the good things of the next year. We had a little party with the kids at my parents, and before i jump in bed and have a recovering good sleep till 2018, I wanted to share with you my Happy New Years Lawn Fawn card. I used my favourite stamp set Fairy friends, stamped the cute fairies and coloured them with Copics. I die cut them with the coordinating dies. I added some shimmer with the Tonic shimmer pen to the wings. The background is stenciled (MFT Mini cloud edges) with Tumbled Glass distress ink. The sentiment (Big Scripty Words) is heat embossed with silver glitter embossing powder (WOW) and i sponged distress ink on it as well to match the background. The rest of the sentiment is from a Joy Clair set (Hello sentiments). I added a silver glitter frame to the scene (Avery Elle Postage stamps frame die) and finished the card with a bunch of rainbow jewels from Honey Bees Stamps. 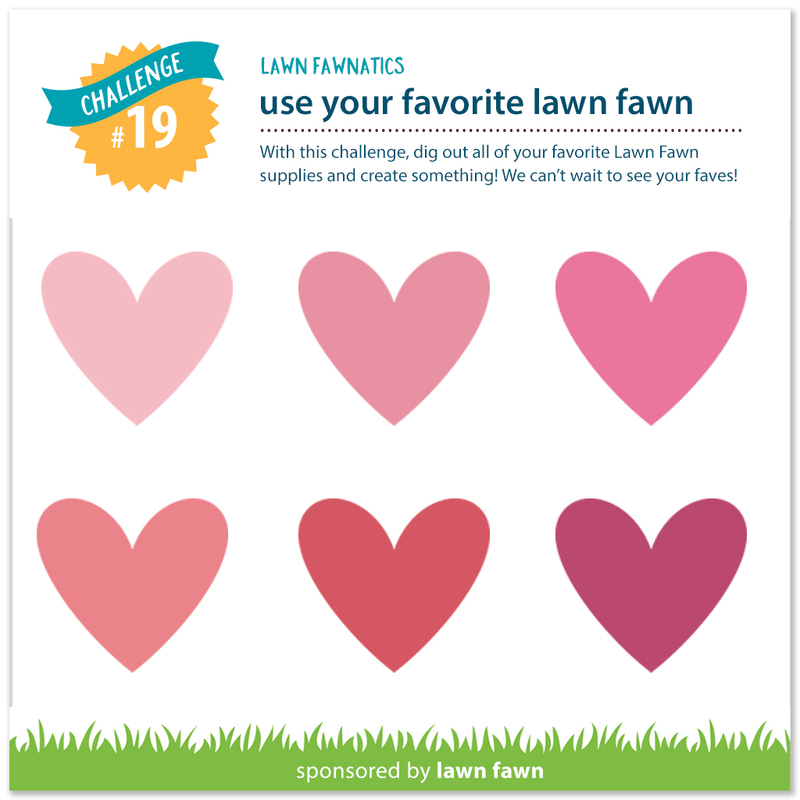 I will upload this card to the Lawnfawnatics challenge #19 Use your favourite LF set and to the Simon Says Stamp Monday Challenge Party and Wednesday Challenge Anything goes. I hope you like my card and thank you so much for following my crafty journey here and on Instagram too. I am so grateful for every single comment you leave me, it totally brightens my day and make it all worth it. Cheers to a prosperous 2018, full of crafting and fun! I am popping in with a quick post as I am playing along the monthly challenge at Gerda Steiner Designs. Isn’t this image just adorable? I wanted to make a card for my dear husband who is in his monthly work shift and hopefully returning to us in a week. I printed and coloured the sweet bunny along with a custom sentiment I created in Word, I used Copics. I die cut the panel with a stitched rectangle die and matted it with a scalloped rectangle cut from glitter cardstock. I also used a big rectangle die to cut the pretty Doodlebug paper. To whip it up, I die cut 3 thin strips of pink cardstock with a die from the Lawn Fawn Picket Fence set and glues some pink buttons on them. I popped up the focal image with 3D foam tape. A bit of my usual finishing touches: black glaze pen, white gel pen, some clear shimmer and glossy accents. I will upload this project to the above mentioned GSD monthly challenge and also to the Simon Says Stamp Wednesday Challenge Anything goes. I hope you like my card and will return tomorrow for a fun New Year’s one. I wanted to share these cuties with you I made for a sweet friend of mine as a present. She loves koalas and I wanted to turn the cute images from the Sugarpea Designs+Simon Says Stamp Stamptember collaboration set into little Santas. I started with stamping an colouring the images with Copic markers and I die cut them with their coordinating dies. The Santa hats are from the MFT Beast Friends stamp set. For the tags I used the small tag from Sugarpea Designs to cut them from heavy weight white cardstock which I previously covered with silver glitter tape. I adorned the tags with some green metallic branches (also part of the tag die set). I adhered the cute koalas on each and finished them with a thin red ribbon. A bit of Spectrum Noir sparkle pen and glossy accents of course I had to add. The card I kept similarly clean and simple too. I die cut a stitched rectangle from white cardstock and ran it through the Big Shot machine one more time with the swirls background die from Simon Says Stamp. I die cut a stitched strip from the same green metallic cardstock and heat embossed a Hungarian sentiment (Scrapfellow) on it with silver embossing powder. I gave it a silver mat using silver glitter tape and assembled the card. The same finishing touches I applied here too: glossy accents on the nose, black glaze pen on the eyes, Spectrum Noir Shimmer pen on the Santa hat. I will upload this project to the Simon Says Stamp Wednesday Challenge Anything goes, to the Work it Wednesday Challenge (use something new) and to the Sugar Pea Designs Anything goes Challenge too. I hope you like it an will return soon for more inspiration. I hope you all had a lovely holiday and it is still the time of relaxation. For us it is the winter break for the kids so we spend a lot of time together playing. The end of the year did not go as planned crafting-wise, I am still going to the post office to send out my belated holiday wishes. I have made a lot of cards which I did not manage to blog, this card set was one of them. But as the Paper Smooches Winter Holiday Challenge is still open, I will share it now. A couple of weeks back I attended a lovely course on Online Card Classes and learnt a great background technique with distress inks from the gorgeous Kristina Werner. I started with stamping the cute snowman couple on Bristol Smooth cardstock and masked them off using masking paper and the coordinating dies. I also added a strip of post-it tape to create snow. Then I applied some distress ink and lifted some of it with a wet paintbrush. I heat set it and repeated again. After I felt ok with the result and it was all dry, I white heat embossed some beautiful snowflakes (SSS) all around the snowmen. After removing the masks, I coloured the couple with Zig Clean Colour Real Brush markers. I die cut the panel with a stitched rectangle die and glued it on a gold or silver mat. The sentiment is a stacked die cut for more dimension, it is also a Paper Smooches die. When the cards were done, I added some google eyes or eerie eyes from Doodlebug. A little Spectrum Noir shimmer, glossy accent and a tiny pearl finished off these cute cards. Which one is your favourite? Hope you don’t mind some more holiday themed cards till the new year. Please pop in again soon for more inspiration. Today a new Inky Paws Challenge #62 is starting, with cozy and warm colours. I just love this colour combo, so wintery and fitting the season. I started with running a piece of Neenah Desert Storm cardstock through the Big Shot machine with a stitched rectangle frame die and then a stitched swirls cover up die from Lil’Inkers Designs. I love this die and use it so often, it looks fabulous on any coloured cardstock when I want to keep it clean and simple. Then I stamped and coloured the cute llama from the new Llama delivery stamp set from Newton’s Nook Designs. I used Copics and simple shading. I used the coordinating dies to cut it out an another piece from fun foam too for instant dimension. I love that a stamped image looks like a puffy sticker in this way. The sentiment is partly die cut from glitter paper (Simon Says Stamp die) and partly white heat embossed on a black banner (MFT stamps and Lawn Fawn die). I made the die cut sentiment more dimensional by adding a few more layers under the glitter one. I used Ranger Multi Matte Medium with a fine tip applicator to adhere the layers. I die cut a stitched small rectangle from light green cardstock to carry the greetings and I decided to stamp some of the music notes also across the card with black ink for a more festive feel. A bit of Spectrum Noir shimmer and glossy accent finished it off. I hope you like it and will join us in the next 2 weeks for this challenge. A random winner will get a 20 USD gift certificate to the NND online store. I will link this project up to the Simon Says Stamp Wednesday Challenge Stitch it and Monday Challenge Holiday cards. See you soon with some last minute holiday cards an tags. 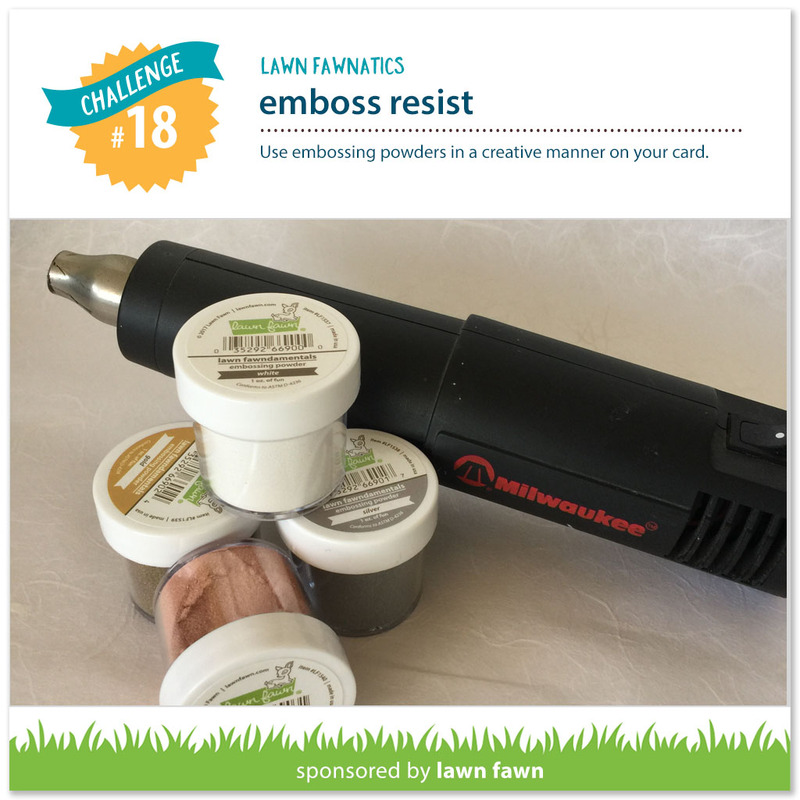 A quick post of a card I made last minute for the Lawnfawnatics Emboss Resist challenge. I saw many beautiful cards from Laura Bassen and she loves to colour with distress inks. I wanted to try this technique, so I white heat embossed a lot of little houses from the Winter village stamp set (Lawn Fawn) on Bristol Smooth cardstock. I cut them apart and sponged different Distress Inks on them, then I used the coordinating dies to cut them out. For the background I added water splatters to a Bristol Smooth cardstock and white heat embossed it. Then I sponged Distress inks on the whole panel and misted with Shimmer mist for a subtle sparkle. I also dabbed some of it with a paper towel for more texture. I die cut 3 stitched hillside borders and stamped the greetings with colourful inks on the smallest one. I re-stamped the upper one with Versamark ink and added clear embossing powder to it. After heat setting it gives a lovely shiny look to the sentiment. After assembling the card, I added some Spectrum Noir Shimmer pen to the roofs and went over the snow caps with a white acrylic marker. I also added some extra dots to the background with the same marker for more snow falling. I hope you like this very cheerful holiday card and will return soon for more inspiration.